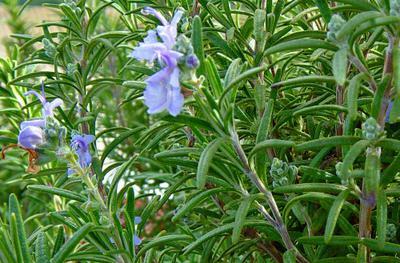 Rosemary is a tender perennial shrub that is ever green with blue flowers. This pungent and distinctive plant has a sweet resinous flavor which has been used as a wonderful compliment to both sweet and savory dishes. This shrub is native to the Mediterranean and is now naturalized in East Africa and Uganda. Rosemary is generally not hard to grow , and once it has rooted, this perennial woody shrub will thrive for about 4 years. Prostrate rosemary-it’s a trailing variety that spreads to over 8ft. Common rosemary- this is tough and grows to over 7ft. Lock wood de forest rosemary- this is the hardy type and easily withstand harsh dry weathers. There also other important types like Gorizia rosemary, Arp rosemary and Salem rosemary. Contact us here to buy fresh Rosemary Leaves and Cuttings. Rosemary prefers light, sandy soils with a high pH range which assures abundance of alkaline. Rosemary is easiest to grow from a cutting, rather than planting seeds. New plants will be able to grow from cuttings and will have the same qualities as the original bush. Cuttings take about 3 weeks for the roots to form. Take about 2-3 inches of cuttings from the tops of rosemary stalks where new growth is happening. Gently pull and strip away the leaves on the stem leaving a few on the top of the cutting. This will give the stem more time to concentrate its energy on forming new roots than feeding the many leaves. Water the cuttings regularly until the roots form and this will take about 3 weeks. Like many herbs you can go ahead and inter-crop rosemary as it’s a good companion plant with beans, cabbage, carrots and sage. When vigorously grown you can harvest rosemary as you are pruning. Pick sprigs of rosemary leaves as needed. The bush will just keep on happily growing. Since rosemary is ever green, you can harvest it all year round. Alternatively, you can just strip the leaves from the stems and store them in an air tight jar. Shovel up soil and mix it with a relative portion of compost. Fill the soil mix in polythen pots meant for seedlings. Cut about 2-3 inches of the top of growing rosemary. Remove foliage from the bottom part meant for rooting. Deep the base of the stem in a rooting hormone, this will increase the rate of rooting. Place the cutting into the middle of the potting and a firm. Water the cuttings to provide moisture. Set the pot in a sunny place but not in direct sun light. Harvest the leaves when the foliage is fully grown.